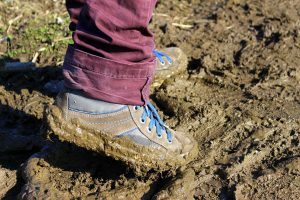 Mud and soil are grayish, brownish, reddish, or yellowish. They are absorbed and built-up types of stains that can contain soil with greases and oils, as well as clay and iron. 6. If stain remains, apply a “paint oil and grease” remover and dry-cleaning solvent alternately, blot until dry.